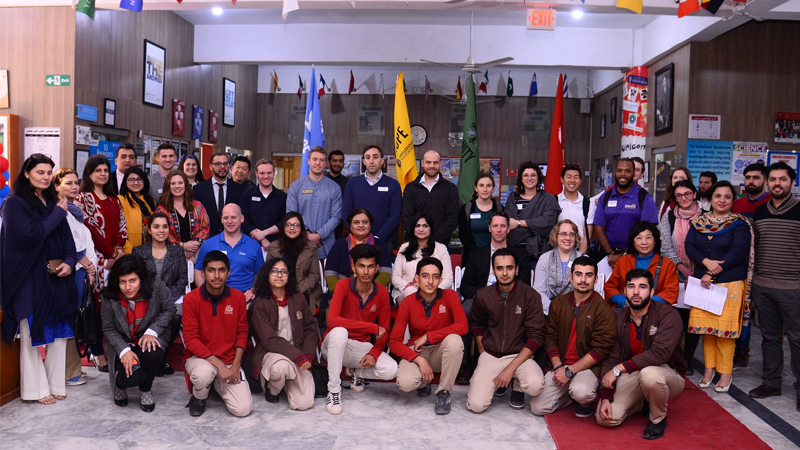 Representatives of 27 US universities on Thursday visited the Millennium College Campus as part of the South Asia Tour 2019 organised in collaboration with the United States Education Foundation Pakistan (USEFP). The representatives of the universities addressed the students sharing the opportunities of higher education in United States. It was followed by an interactive question and answer session in which IGCSE III, IBDP, AS and A-Level students posed pertinent questions regarding studying in the US, scholarship opportunities, cultural differences and environment in colleges and universities there. The 27 universities that visited the Millennium College Flagship Campus are: DePauw University, Merrimack College, Siena College, Albion College, Stony Brook University – SUNY, Northern Illinois University, University of LaVerne, Northern Arizona University, St. Cloud State University, Minerva Schools at KGI, San Jose State University, Drake University, Western Kentucky University, DePaul University, Creighton University, Southern New Hampshire University, University of Wisconsin Eau Claire, Berkeley College, McNeese State University, New York Film Academy, University at Buffalo, SUNY, Indiana University – Purdue University Indianapolis, SUNY Plattsburgh, Springfield College, University of Northern Iowa, Valparaiso University and Ohio Wesleyan University. Millennium Campus is a global school/college committed to meeting the needs and ambitions of a diverse range of students by providing challenging academic programs underpinned by innovative research, scholarship and professional practice. Published in Daily Times, March 8th 2019.